Ted Welker began working working at KRVM in September 2007, shortly after moving to Eugene from the river town of Winona, Minnesota. 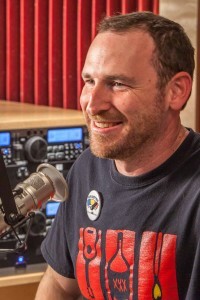 He had spent the previous eight years hosting various shows on Winona’s college radio station, including seven years as host of Phish Phry, a jam-band music show. Now part of KRVM’s lineup, Ted feels right at home, presenting his own personal take on jam-band music on Grooveland, and co-hosting Live Archive. Ted keeps an open mind (and ear) to all music. But, lately, his passion for bluegrass has been a strong influence, taking him to festivals ranging from the Northwest String Summit in Oregon to the Boats and Bluegrass festival in Minnesota, as well as several trips out to Colorado’s Telluride Bluegrass Festival. Beyond bluegrass, Ted’s love of live music regularly brings him out to local music venues. In 2012, Ted became public address announcer for the Eugene Emeralds minor league baseball team at PK Park; in 2013, he took on the same role for the University of Oregon Ducks baseball team.